Medical Cyclical Therapy is a treatment which prevent hair fall by inducing new hair growth and using medicines once in a few days. It has no side effects and it can be done in minimum medication cost. 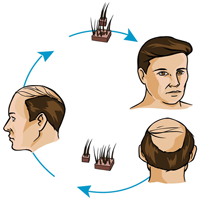 Cyclical medical therapy controls hair fall in 2 months and improves hair growth in 4 months. It is an innovative and affordable hair growth therapy and its treatment procedure is broadly tested and clinically proven. It is consisted of oral formulations that mostly contain the micro-nutrients needed for good healthy hair growth without adding any hormones. This cyclical hair therapy activates hair follicles, rouses growth, strengthens the roots and protects them from damage. In Mesotherapy ingredients like growth factors and micro-nutrients are injected in the layers of the head to scalp skin and to produce better results. Mesotherapy shows positive results with hair re-growth in both men and women. In this therapy a specialized cocktails given to boost vitamins, amino acids, nucleic acids and co-enzymes in hair so that it can improve blood circulation on that particular area. As the result of better circulation your hair follicles will be nourished which can immediately improve the hair re growth. Mesotherapy is done via injection gun which flourishing the hair growth sooner and in a less painful way. For better results you may need as many as five sessions of Mesotharapy treatment over the period of four to six months. 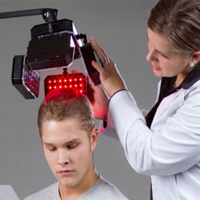 Low-Level Laser Light is one of the most successful therapies to cure hair loss. 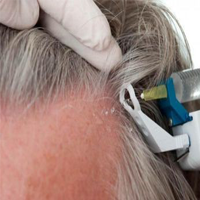 This medical treatment applies laser light to support hair growth. 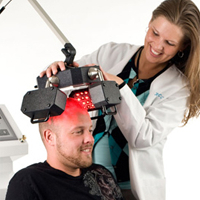 It is also called ‘Phototherapy’ or red light therapy where the light-emitting device may be a laser and/or light-emitting diode (LED) that can penetrate the scalp. Various researches in this field prove that it is a safe form of light treatment. It is usually used to treat the genetic forms of hair loss common in men and women. Stem cell therapy as a hair fall treatment is the process of separating adult stem cells from abdominal fat and reinserting them into the scalp to produce good results. In the beginning of the process a few ounces of fat is removed from the patient in a “mini” liposuction procedure. Once the fat is removed, the stem cells are isolated. After this the stem cells are then re-introduced in the scalp to produce new hair. The treatments are conducted in doctor’s office in a less painful way. Stem Cell Therapy is an exceptional treatment for hair re-growth that encourages new hair growth within 3 to 4 months of therapy. This therapy promotes a constant supply of cells for the fast development of hair cells. Platelet Rich Plasma therapy is a non-surgical therapy applied in hair restoration that require stimulation of hair growth for hair loss conditions. Evidence supports PRP therapy is a promising treatment in the field of hair restoration. 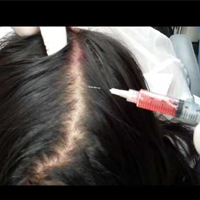 In this procedure your own Platelet-Rich Plasma (PRP) is injected into the scalp with the help of a needle. Consequently the growth factors in the blood cells began to activate that stirs further hair growth within short period of time. This inject able treatment uses the patient’s own blood without surgical rather natural way.